Did you enjoy Valentine’s Day? I’m almost embarrassed to admit that we did the M&S dine in for £20, along with half the country… I loved this idea from A lot on her plate to make pie for Valentine’s Day. Best present ever, right? The highlight of our week was some awesome hotdogs. I never think to make them, but done properly, they’re soo good. Nothing too complicated – fried onions and good quality sausages in brioche buns with mustard. Sweet potato fries alongside are pretty good. I did a pretty classic recipe but topped it with pumpkin mash. Delicious. Whenever I make anything like that, I try to make at least double while I’m at it to put some in the freezer. Jamie’s recipe is a good un. I spotted this in my Delicious mag a couple of months ago and it’s good. Quick, easy, healthy – ticks all my boxes for a weeknight. Recipe here. TFI Friday, right? By the time it gets to the end of the week, all I want is my sofa, a fire and a large glass of wine. I do not want to do any cooking. I made this last Friday, and by made I mean warmed ingredients. I grabbed everything in the Sainsbury’s local on the way home and had dinner ready in about 10 minutes. 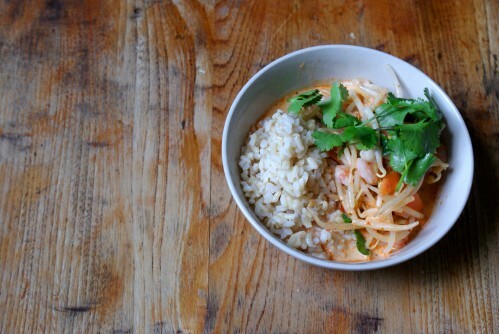 A totally inauthentic Thai vegetable and prawn curry. Warming, comforting and quick. Much tastier than the takeaway I really wanted and slightly better for you too. First of all, my first post on Brixton Blog is now live! I’ve lived in Brixton for 6 years now and Brixton Blog is such a fantastic community website (and free paper), so I’m really pleased to be part of it. 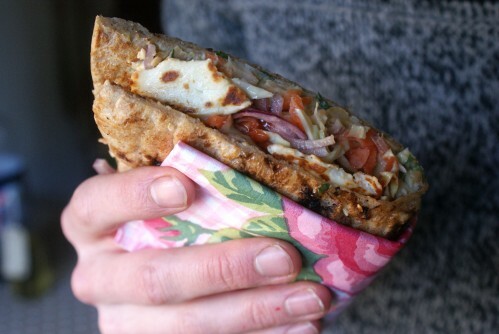 The recipe for chickpea and haloumi naanwiches is also pretty awesome, even if I say so myself. Perfect for a weekend lunch or a quick after-work dinner. I’ve had other things on my mind for the past year or so, but I honestly think the biggest reason that I put off returning to this blog for so long was that I didn’t have pretty enough pictures. Then I read this blog post about blogging (meta!) and when she wrote ‘Blogs became less of a reflection of a way things are and more a reflection of what people want,’ it really struck a chord. While I’m totally guilty of being swept up in the Pinterest world of beautitful lives and pretty blogs, I’ve decided to go a little easier on myself and write what I want, when I can and if no one reads it, that’s ok! This blog is as much for me as anyone else. In fact, I use it all the time to cook my favourite recipes like these sweetcorn fritters and this super easy tomato and chilli jam. So there you go, here’s to being around these parts more often. I’ve been thinking about coming back here for a while and every so often filing away possible contenders for blog posts. Then the other day, my friend text me to thank me for the ‘best brownies ever’ and a little lightbulb went off: these brownies are exactly what I should be telling you about. I’ve been loyal to Nigella’s brownies for a long time, but my friend brought these round for me last year when I had a tiny baby, no time and a seemingly insurmountable appetite (thanks breastfeeding!). I was hooked, I demanded the recipe and have made them many many times this year. Each time people claim they are the best. brownies. ever. So what’s the recipe?? It’s from Dan Lepard (who I love, love love) and what makes it so good? Booze. He uses bourbon, but I use rum as I always have some around and it gives them a real kick. Cocoa powder. Makes the brownies intensely chocolatey. Texture. These are slightly more cakey than Nigella’s brownies which I find makes it easier to judge when to take them out of the oven. 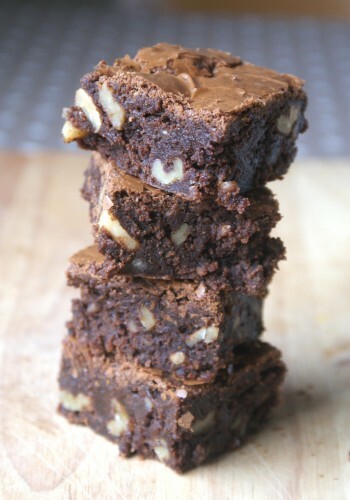 (I’ve definitely made a few batches of brownies in the past that were on the raw/’fudgey’ side.) Note: I use slightly less flour than Dan (150g) as I like my brownies a bit gooey. So basically, get to it. Make these brownies. 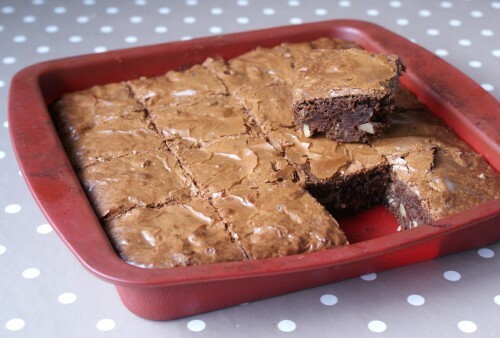 Even if you think you can’t make brownies, give this recipe a go, you can thank me later. You’ll see in the picture up above that I made these brownies in a rather battered looking silicone mould. I highly recommend it! It’s the perfect size for brownies (20cm square) and I never have to grease. Anything I bake in it just slips out. I’ve spent a long time looking for the perfect recipe for breakfast pastries and I thought I had it with these. I’ve even veered from Nigella’s trusty recipe and dabbled in (delicious) recipes from Scandalicious and Sweetapolita. But sometimes, all it takes is a little tweak in the method to take something from very good to perfection. 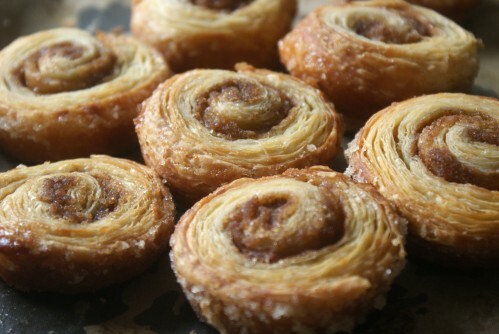 And believe me, these pastries are perfection. They still use Nigella’s brilliant food processor Danish pastry as the base, but instead of just baking the pastries on a tray, they get baked in a muffin tray, and herein lies the genius; baking the pastries in a muffin tray helps stop them unravelling and, crucially, ensures that perfect squidgy centre that is surely the best bit of any pastry. Honestly, they’re a revelation. I made these for a brunch with friends the other day, and in between appreciative moans, we discussed other possible fillings. Suggestions included Nutella and extra chopped hazelnuts (OMG) or a thick vanilla custard. Unfortunately, I can’t claim credit as I’ve been using this recipe, word for word, from Seven Spoons. I’ve made a few tweaks; namely, I make twice as much pastry than you’ll need so you can stash half in the freezer for easy pastries next time. And, I’ve translated into UK friendly measurements (cup measurements drive me mad). Scones for breakfast? Yeah, it’s pretty weird, but bear with me. 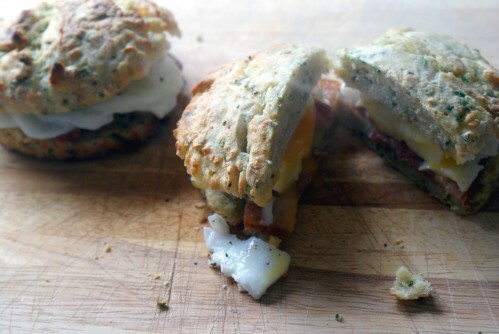 These are savoury scones, flavoured with cream cheese and chives, split and filled with bacon and a poached egg. See what I mean? This is a goood idea. I made mine quite big (using the 10cm fluted cutter) in order to fit an egg and some bacon inside, but you could make mini versions and fill them with cream cheese and rocket for an afternoon tea (I’m all about the savoury at an afternoon tea, it’s so often overlooked) or maybe avocado and roast tomatoes or goats’ cheese? You get the idea. Sorry. I know it’s been a long time since I shared anything here; it must be bad because my friends have even starting complaining about the lack of new recipes (despite still being in receipt of my cooking!). I do have an excuse (of sorts), we just bought our very own flat, which is of course exciting, but it does mean weekends are filled with DIY and trips to Ikea. I’ve also been cooking a very special bun in my oven (if you catch my drift) which has robbed me somewhat of the motivation to actually photograph and write up a recipe. Thankfully, I’ve still been cooking…and eating. I’ve got a few recipes that I’m hoping to share with you soon, but in the meantime I wanted to share some of my favourite things from the past few months. I made this lovely apple cake at the weekend from the Ottolenghi cookbook – the icing on the cake (literally) is the maple syrup cream cheese icing. Have the heard about the Joy the Baker podcast? It’s perfect company for a gym session, long walk or even the housework. I’ve discovered Pinterest, big time. 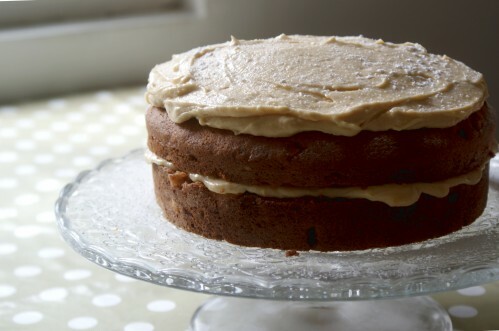 Here are some of my boards: cake ideas, recipes and the home. Speaking of recipes, this ice cream is outrageously good, as are these muffins. Oh, and when I’m making all these sweet things, this makes me feel healthy (I added prawns to my version, which was delicious). This website has been distracting me at work. I finally went to Trullo for some truly delicious Italian food (and you can reserve!) and I got to Pitt Cue at 5.45pm to beat the queues for a meal that was well worth it (order the slaw if you go and save room for dessert). Of course, I’m still loving Brixton Village and the current favourite is Mama Lan for excellent dumplings and the best chicken wings ever. I’ve been making my own pizzas for a long time. I remember when I was still at school, trying to recreate the awesome pizzas at Croma with shop-bought pizza bases. I mean really, why did I bother? Those bases are so gross, anything would have been better. Even an old school baguette pizza. I moved slightly up in the world when I discovered that flatbreads make a pretty acceptable pizza base and I still make them now when I can’t be bothered going all out. But when we started making bread, we started experimenting with homemade pizzas as well. We usually make sourdough pizzas (and if you want to try, make the recipe here), but I find that any old bread dough will work. Unfortunately, our trusty pizza stone broke recently so this time we experimented with frying the pizza for a few minutes first (to cook the base) and then finishing it under the grill. 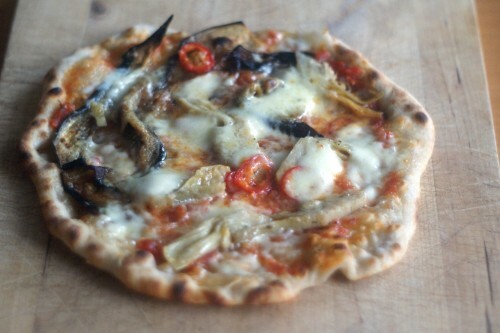 I have to say they worked out brilliantly – no soggy bases and the grill gives the pizzas that lovely burnished look. As for toppings, I like olives, grilled pieces of aubergines or courgette, pine nuts, sliced chillis, really good salami or bacon. Once it comes out from the grill, I also like to top it with some rocket leaves dressed with lemon juice and olive oil. 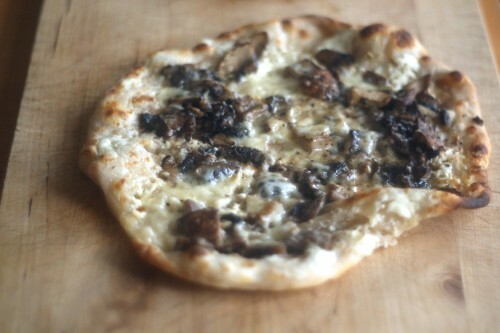 My other favourite is a white pizza, I spread the pizza base with crème fraîche and top with softened leeks or fried mushrooms and thyme. Oh, and for a totally legitimate breakfast – top the finished pizza with a fried egg. For the pizza geeks among you, Dan Lepard wrote an excellent guide to making pizza and there’s also the Guardian’s How to make the perfect pizza. I recently discovered caramelised white chocolate – sounds pretty weird right? Wrong. Caramelising it takes white chocolate from sweet and sometimes cloying to something similar to dulce de leche or (with a pinch of salt) salted caramel, but still with a hint of white chocolate at the end. Starting to sound better? The idea is to break up some white chocolate and bake it in the oven, taking it out every so often to smear the molten white chocolate over the tray. After a good 50-60 minutes, it will change colour to a deep golden-brown and this is where the magic is. The first recipe I made, the caramelised white chocolate gets swirled into ice cream which I served with a jelly made with homemade blackberry liqueur and let me tell you, it was one of those truly awesome dessert experiences. Since then, I’ve made the ice cream a few more times (and you should too), but I’ve also been thinking about what else I could use the chocolate for and of course, cake came to mind. In particular I thought it would make an awesome icing. I’ve based these cupcakes on my favourite fudgy chocolate cake recipe, but tweaked it slightly to make them less sweet and with a richer chocolate flavour. 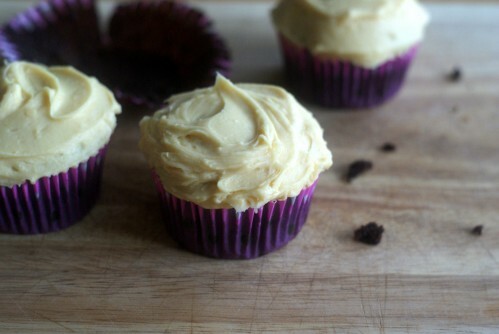 They act as the perfect foil for the butterscotch-like icing. You know what I like most about these cupcakes? 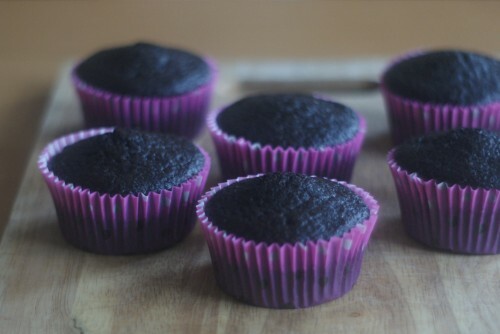 I actually like the icing, usually it’s too sweet for me and there’s always too much of it, but here it works perfectly with the cupcakes.